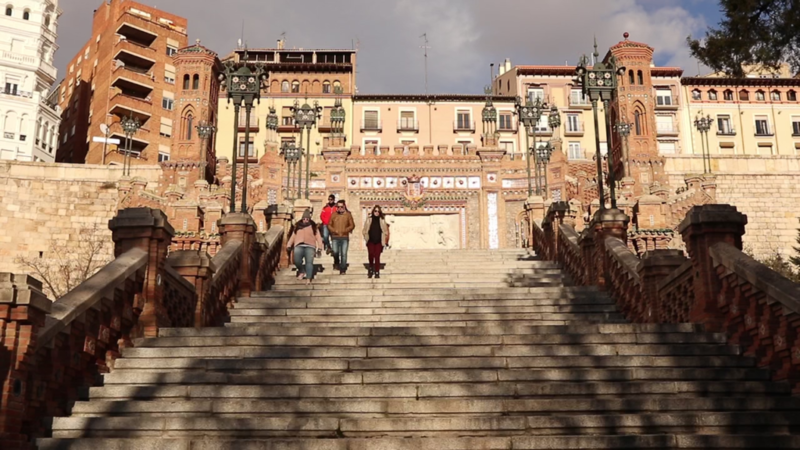 Why do we recommend that you go off Spain’s beaten path and visit Teruel? Two main reasons are that the city is known for its Mudejar architecture and Jamon Serrano or Serrano ham. For you Jamon lovers, this is the only reason you need. Another reason why we recommend Teruel is because there are four UNESCO World Heritage sites in the city. Taking all this into consideration, we knew that Teruel would be a nice place to visit while we were in Aragon. 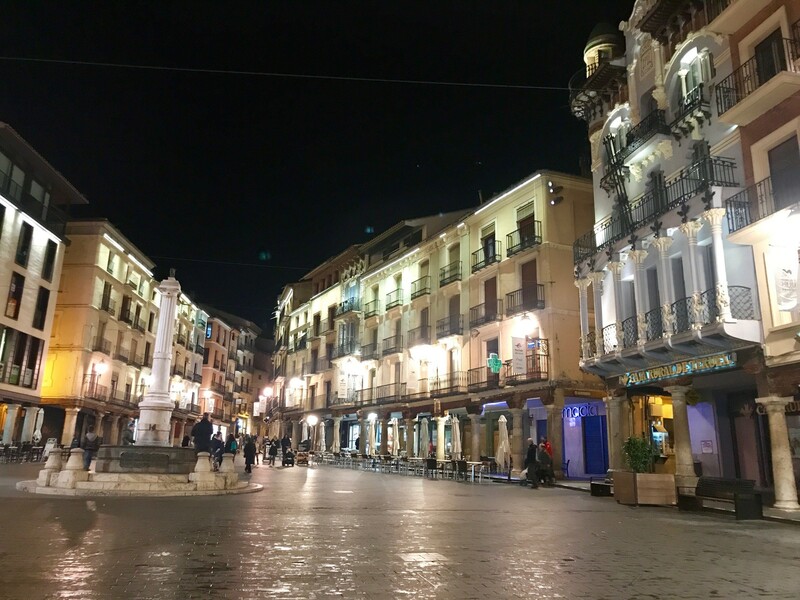 This part of Aragon is the least populated area in all of Spain, for example, Teruel’s population is only 35,000 with most of the region’s population living in Aragon’s capital, Zaragoza. We had just spent two nights visiting Albarracin which is only a 30-minute drive east of Teruel. Both cities are inside Teruel Province and within the region of Aragon. 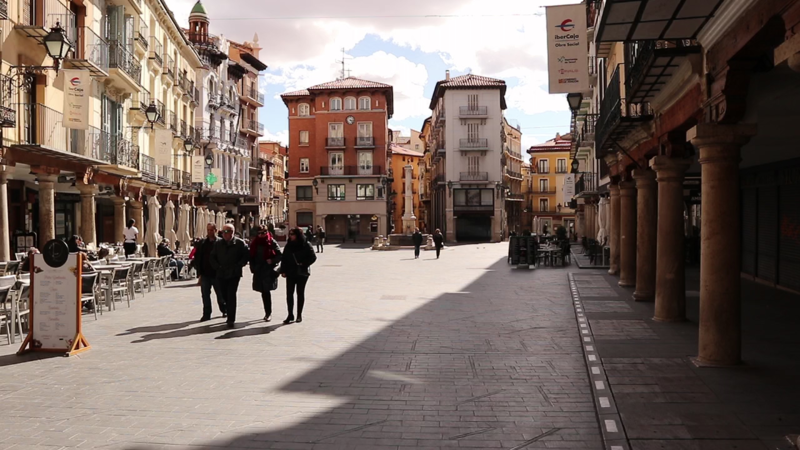 Play the video below to learn more about our journey to Teruel. Plaza del Turico at night. The Plaza del Turico is the heart of the city. In the plaza, you can find cafes, bars, and restaurants filled with locals. The plaza is a good place to stop and relax after a fun day of exploring. The fountain in the middle of the square is decorated with bulls. 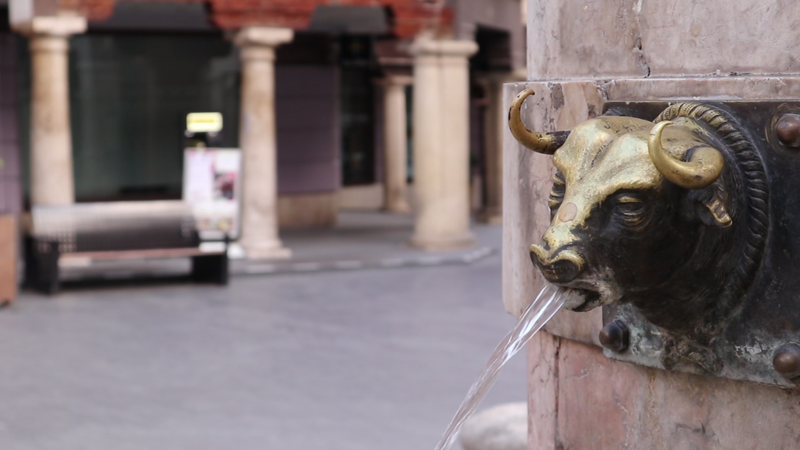 Legend claims that during the reconquest of Teruel by the Christians, they set the horns of several bulls on fire and sent them running through the streets of Teruel to drive out the Moorish forces. I know if I saw a raging bull running towards me with its horns on fire, I would leave town ASAP! Located a few blocks away from Plaza del Torico, is the famous Church and Tower of Santa Maria of Mediavillar. The Cathedral is a stunning prime example of Mudejar architecture. The church was constructed in the year 1171 and the Mudejar tower was added in 1257. The cost to visit the church is 2€ and photos and videos are prohibited. The tower is believed to have been built in the early 14th century. 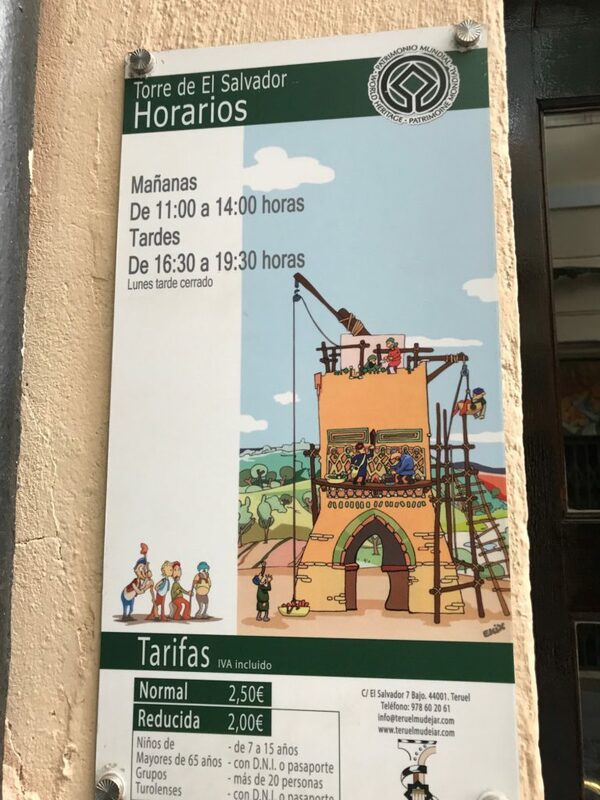 This is a must-see while visiting Teruel. Also, visitors have the ability to visit the Tower’s museum and climb the stairs to the top to take pictures of the beautiful surrounding countryside. 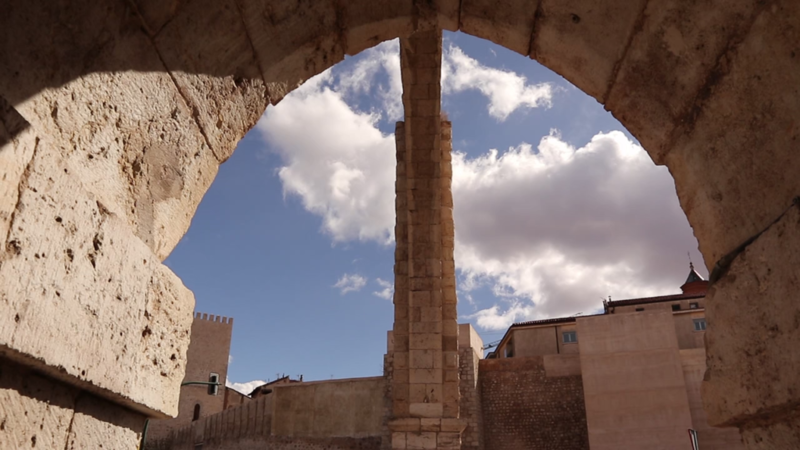 Roman style aqueduct in Teruel, Spain. Originally built in 1537, the aqueduct is an outstanding example of Spanish Renaissance architecture. The water is taken from the Pena del Macho spring four kilometers outside the city. The history of the cathedral dates back to 1171 and the cathedral was originally built in the Romanesque style. You definitely will want to visit this cathedral for its famous Mudejar architecture, but its 14th-century wood ceiling is world-renowned. In 1986, the cathedral was listed as a UNESCO World Heritage site. 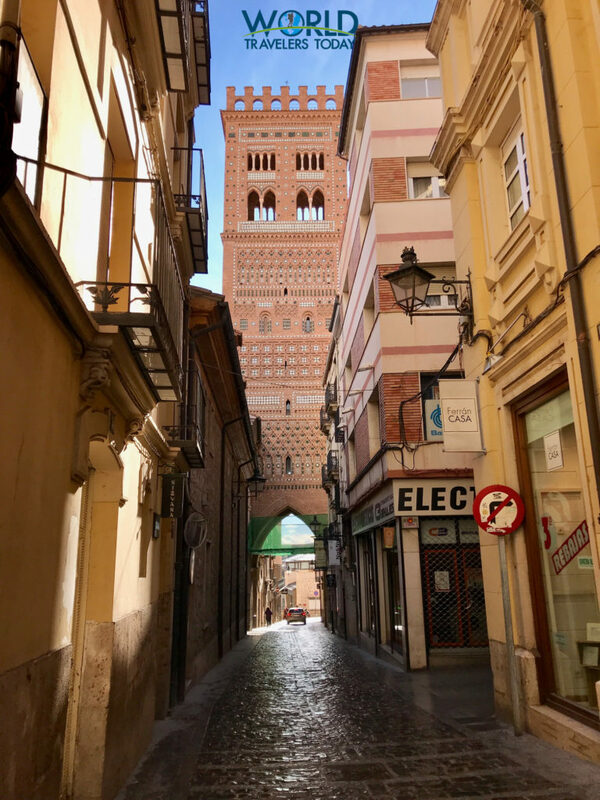 Originally built in 1921 to connect the center of town with the train station, the Escalinata is a beautiful example of neo-Mudejar architecture. We recommend a two-day visit to Teruel because its a good amount of time to see all this city has to offer. You can custom build your itinerary with us. 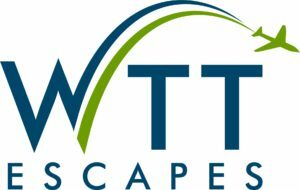 Vist our custom itinerary page to learn more. You can also visit our Spain page to see more of this wonderful country.